As a young reporter covering courts in Caldwell County in 1987, I noticed what a high percentage of people facing charges were roughly my age. Sometimes what landed them in trouble was a situation similar to one I had been in, but a different choice here or a different starting point there made all the difference in the outcome. There was not a lot about Sammy William Sturgill or his background that felt familiar to me, but we were both 22 – he was born in October 1965, I was born a couple months earlier. We were both slim. He appeared to be in better shape. He looked like a nice enough guy, and from the thumbs-up he flashed at the News-Topic’s photographer while being led out of the courtroom during his murder trial, he sure seemed to have a sense of humor. Sturgill testified in his own defense in that November 1987 trial, a not at all common thing for murder suspects to do. I recall that he was calm and seemed relaxed as he described the events of Feb. 3, 1987, that ended with Walter Blevins, 68, bleeding and unconscious, suffering from many injuries but dying of a blow to the side of the head. Both of them, Sturgill said, were drunk; Sturgill described himself as having a chronic drinking problem. But in Sturgill’s telling, Blevins was the aggressor, angry that Sturgill had sold him for $6 a whiskey bottle half full not of whiskey but a mix of whiskey and soda, and Sturgill, drunkenly defiant, refused to give the money back. Blevins pulled a pocket knife. 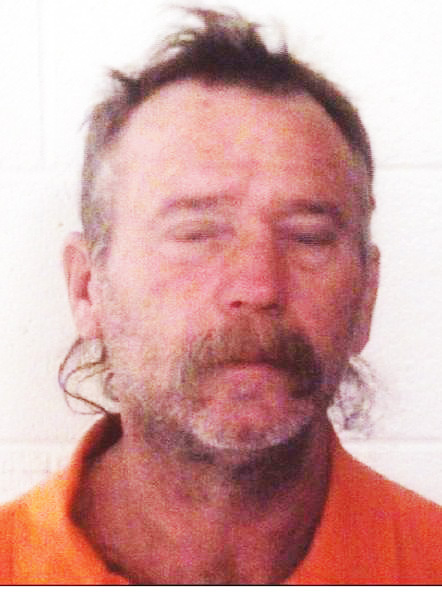 Sturgill, stumbling back into the woods, saw a discarded wine bottle, picked it up and smashed Blevins in the side of the head, causing Blevins to drop the knife, which Sturgill said he picked up and used to stab Blevins. The story sounded reasonable to me. But Sturgill’s version didn’t account for the extent of Blevins’ injuries, which included a number of fractured ribs, the prosecutor pointed out. Nor did it explain how fibers from the Blevins’ wool cap became stuck to the toe of one of Sturgill’s boots. The prosecutor’s contention was that the fatal blow to the head came not from a wine bottle swung in self-defense but from a kick to the head while Blevins already lay bloody and broken on the ground. I had largely forgotten that trial until a couple of weeks ago when I was searching through microfilm at the Caldwell County Public Library, trying to find a particular story I wrote around that time and came upon that front-page photo of Sturgill giving the thumbs-up, with perhaps a wry smile under his moustache and a light in his eyes, on the day that he testified. Last week, after Sturgill himself died after being stabbed in another confrontation with an older man, I kept thinking about that photo — the distance from that courthouse scene to a recent county jail mug shot of Sturgill, and the distance from my seat in that courtroom to my office now. Sturgill’s family describes a man who, when sober, was kind and generous, who planted flowers and vegetables at the Gateway Nursing Center on Harper Avenue. When he was younger, “he was a good kid,” his older sister told the News-Topic on Wednesday. It all awakens in me that feeling I had at my first full-time job, sitting in court, watching young men my age stand not more than 10 yards from me and face judgment. Where do things begin going wrong? Where did things pass that point that ultimately one person would sit on one side of that courtroom, able to walk out the building’s front door, and another person would sit on the other, being led out the back in handcuffs? One of my reporters seemed stunned recently to hear me say that one day most people probably would get all of their news, including their hometown news, from Web and mobile devices. She was barely out of college and a member of the generation of “digital natives” who grew up with the Internet, yet she somehow had a baby boomer’s romantic attachment with the printed page. The newspaper’s website to her was a public service, to make news quickly available in case it was needed, but not a replacement for ink on paper. Why would there not be a demand for a printed newspaper? I think I was more stunned to hear her than she was to hear me. I thought maybe she was joking. We had never had an extended discussion about the news business model. I knew she was adamantly opposed to charging online readers for access to the website. She knew that advertising essentially pays the bills for a newspaper but that print circulation and advertising have been in industry-wide decline. Yet somehow she had not done the 2 + 2 math and thought out where that all leads. That’s a thought I don’t like to think. I know that there are people of all ages who like to read, and importantly there are children, teenagers and 20-somethings out there who read newspapers and printed books – I see them in coffee shops, or in photos that friends post on Facebook of their children – but in general the way of the world is moving in the opposite direction. Fewer people do. A couple of days ago, my wife was in a coffee shop downtown when a teenage girl there was told by the shop owner that she was in a picture in our newspaper’s print coverage of the Pop Ferguson Blues Heritage Festival. The girl didn’t care. Then my wife told her that the newspaper also put the photo on Facebook. The girl instantly went to find it online. Many people have a sentimental attachment for reading on paper. But sentiment isn’t a business model. UPDATE: Another view: “Print is under pressure but it does have a real business model, one that brings in real revenues. A few weeks ago, an article in The Atlantic by Daniel D. Snyder examined the clash between being a superhero with a secret identity and the ethics of journalism, namely being open and honest about who you are and how you got the details for your stories and photos. As I left the news building for the last time, the breeze fluttered through cards in the Rolodex atop the box I carried. The old Rolodex had been with me since I started, filled with contacts made over more than two decades. It used to be every reporter had one, but over time you saw fewer of them around the room. Now it’s almost as much a relic as the lead spike sitting in the bottom of the box with my other things. No one has actually “spiked” a story since the day the last typewriter left the newsroom, but Ed, one of the old copy editors, couldn’t bear to take it off his desk, and when he retired a couple of years ago he handed it to me as a parting gift. Maybe I should have handed it off myself when they told me to clear out my desk, but as I packed the box, it was as though memories were piled deep on that spike, so I picked it up and placed it on the box to carry home. News has been my life. Well, at least my work as a newsman made me feel a part of humanity in a way that nothing else did. There was electricity to working a story. It made me feel alive, charged. Not as charged as flying out and being in the action itself, actually catching the robbers or putting out the burning skyscraper, but being a reporter on the scene was always the next best thing, and there were plenty of times I could tell the trouble wasn’t so bad and the police or fire department could handle it while I took notes and shot bull with the other reporters. Now, here I was, laid off, downsized, holding a box with a Rolodex, some personal files, cubicle knickknacks and mementos. A stuffed Cartman doll. A few photographs. A signed cartoon from the editorial cartoonist, who had been laid off a few years ago. A copy of the first A1 story I was part of, about a corrupt senator. A fragment of the rocket that narrowly missed hitting the city, last year’s biggest story. A Mason jar of river water, first captured and sealed up for an environmental story 17 years ago that became both mysteriously browner every year and also somehow now was a little more than half its original volume; a newsroom legend, and now it sat here, in my box, out in the sun for the first time in 17 years. I just stood there by the car, looking down at the box. I hadn’t been unemployed since that first time I arrived in the city. Once, when unemployment rates were high, a man I interviewed told me how he remembered every detail about the moment he was fired – the ticking second hand of his boss’s clock, which snagged a half-beat near the 9 every time; the smell of cigarettes that clung to his boss’s shirt; the way his boss looked almost afraid of him. I understood him now in a way I didn’t before. Though truly what I think I will remember most is the powerlessness. I had never felt that before. I saw the end coming, as I had countless times before outside that building, but this time, sitting in that chair in human resources, there was absolutely nothing I could do about it. About two dozen of us were let go today. Some simply left everything behind. Most, like me, gathered their things and walked out holding a box and trying to keep a brave face. A few I had seen leave were angry. Michael, for instance, strode out muttering loudly, punctuating everything with curses as his wiry, brown hair bounced around him. When he reached the sidewalk, he turned and drop-kicked his box at the building, then turned back and kept walking to the parking lot. Betty’s work habits had been the same for 37 years. She was careful, thorough and conscientious. That used to be enough to make her a model around the newsroom. But it wasn’t enough anymore. She refused repeated requests from the editors to participate in the newsroom’s expanding number of webcasts. She insisted on holding on to her stories until the absolute final deadline, polishing the words, and didn’t care about getting the story out early enough for the social media team to link to it before Facebook traffic peaked. She never got the hang or the habit of posting her stories to the website herself. She wouldn’t use a digital audio recorder. She never even included Web links – an editor looked them up instead – and she gently scolded colleagues who used “Google” as a verb. Like all journalists, I had recognized the business was changing. More and more, reporters kept in constant contact with the newsroom and filed updates throughout the day, just a paragraph or two by email or cellphone or even text message. A reporter on a major breaking story in a city as big as this one often had to take a few minutes for at least a phone interview for use on the Web and TV. All of this was exactly why I found my possessions in a box. It wasn’t that I didn’t want to change with the times or didn’t know how to do all those things. I just couldn’t. You can rescue a crashing airliner and later write about how it was saved, but you can’t interrupt the rescue to post a live update. Even once it’s on the ground, you can’t just whip out your phone and write a bulletin. The marauding alien bent on destruction won’t simply pause for a couple minutes just because you need to step aside to call the newsroom with the latest on which buildings have been seriously damaged and where traffic is blocked by debris. Back when I started with the paper, you had a deadline. One. The job was easy. Whether I was in uniform part of the day or always playing the reporter, all I had to do at the end was write everything I knew was true and turn it in before Perry blew his top. I could type so fast I’d break the keyboard. But even if you’re fast enough to dodge a bullet, you can’t be in two places at once. The company began offering multimedia training a year ago, and I signed up. But something always came up. Once I was headed for a session on recording and editing video for the Web, but a man in Chicago had set a bomb protected by lasers, so I had to skip it. Once I was in a session, but then a meteor was about to wipe out Fiji, so I pretended to be sick and excused myself early. Other times I showed up late. That rolled around my head a few times as I stood outside my car, looking down into my box. I had heard it before, but not quite like that. I opened the back door of the car and slid the box onto the seat. Out of the corner of my eye I thought I saw someone coming, then I turned and realized it was my reflection in the window of a van parked beside me. For a moment, the figure I thought I saw looked frail, slumped. I straightened my shoulders. Looking up at the building again, I saw Perry come out on his way to lunch. I hope a meteor lands on your house, buddy, I thought. See if I lift a finger to stop it. Attention, single people: If you meet a reporter through online dating site eHarmony, run the other way. Not because reporters make bad partners – not that I’m saying they make good ones, either – but because eHarmony put out a list this week of the “15 reasons to date a reporter.” Although Kristen Hare at Poynter.org found at least some of the 15 to be “spot on,” little on the list resembles the people in any newsroom I ever worked in, or passed through, so I question whether the reporters on eHarmony are telling the truth about their occupation. For instance, it says, “Reporters are usually self-employed and have flexible schedules.” What?! A self-employed reporter is usually an unemployed reporter, and for a reporter, “flexible schedule” most often means he or she will have to cancel a date to go cover a story. “You’ll be getting a great Scrabble partner” – or you would, if he could spell. Newsrooms are full of dictionaries for a reason. “Reporters meet deadlines”? When I worked in Winston-Salem, reporters’ deadlines were observed mainly in the breach. I have never heard another editor say that isn’t the norm. “Reporters make great dates to parties and family events, as they’re great at asking questions and engaging others in conversation.” Hmmm. I have known such extroverted reporters, many of them TV reporters, but most newspaper journalists are introverts. We got into the business because we’re writers, not talkers. We learn to ask questions of strangers because it’s required by the work, but it doesn’t come naturally, and on our own time we’d rather not. I well remember a party that a co-worker’s non-journalist spouse gave years ago, where she invited a bunch of her non-journalist friends in addition to her husband’s journalist co-workers. All the journalists gathered together and talked shop in a corner while the party went on without them elsewhere in the house. Afterward, she berated the entire newsroom for their behavior. Date a reporter and expect that, then be happy if your experience is not quite that bad. “Your date will remember your birthday, the way you like your coffee, and that promise you made her last week.” Sure, just don’t ask my wife how reliable my memory is when it comes to events she has even written down on the calendar on our refrigerator. “Reporters get invitations to swanky events” so you can “hobknob with the mayor and other local celebrities.” A reporter’s “invitation” usually translates into an assignment to cover the event and write about it. Little hobknobbing there, and free passes for spouses or dates are not included. Enough? Not nearly. I have to wonder whether the list-maker ever paid attention to the comics. Clark was a schlub. No one ever wanted to date Clark Kent, intrepid reporter. They only had eyes for Superman.